atomicmike! » Blog Archive » It’s a twister! I just followed the instructions on J. Phil Thien’s site (above) and forums, so I won’t go into too much detail. 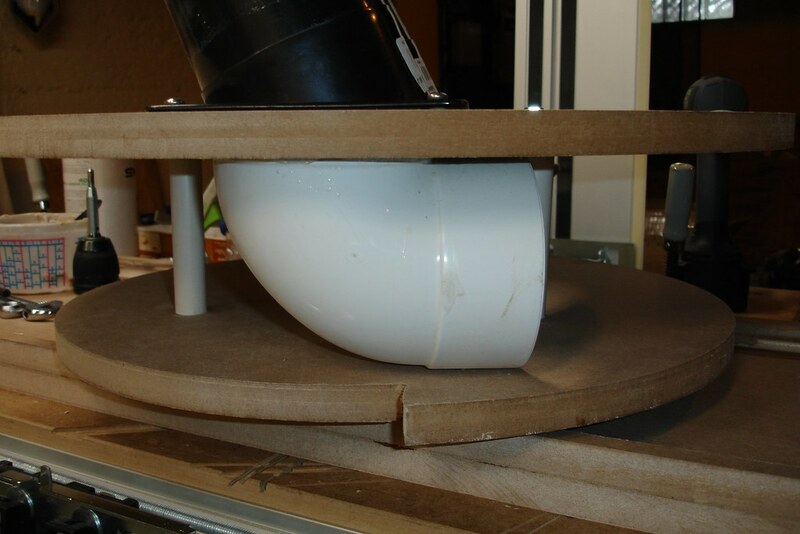 The two main components are cut from MDF using a homemade trammel to get nice round circles. 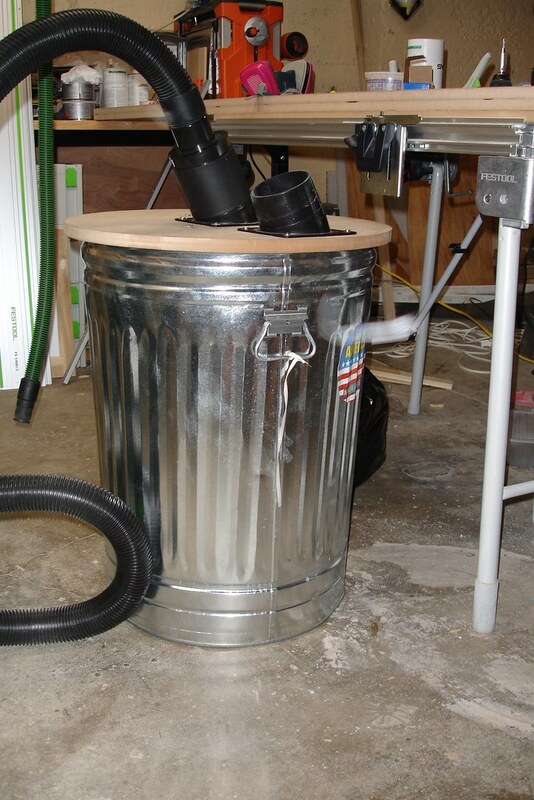 I used some 1/2″ PVC pipe as spacers between the lid and the baffle and attached the 4″ PVC fittings with a healthy amount of epoxy (my new favorite toy!). 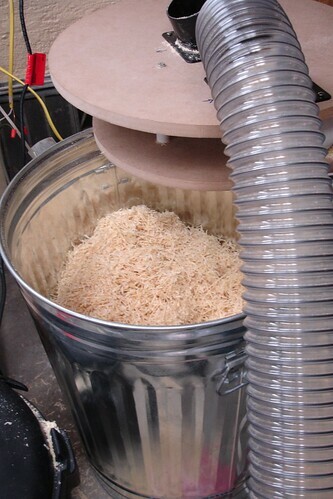 To test it out, I ran a bunch of pine through the planer to generate a lot of shavings. It needs a little bit of tweaking, but I’m still quite impressed with the results. 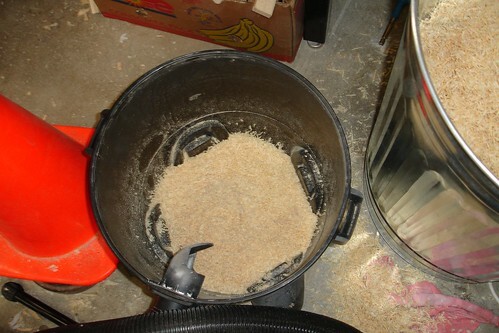 Until I overfilled it, the cyclone did a reasonably good job of separating the shavings and dust out of the air. And even with the trash can filled, the shop vac only sucked up a comparatively small amount of debris. I suspect it will perform much better once I have it hooked to a proper dust extractor (most likely one from Harbor Fright [sic]), instead of the smaller shop vac that I’m using with it now. Even still, it’s an exciting addition to the shop. I have a number of projects I’ve been delaying, because they involved quite a bit of planing. Before I built the separator, I had to send all that debris straight into the shop vac, clogging it up after a just a pass or two. Frustrating, to say the least. And more exciting still, this opens the way for the next few projects. In fact, that pine I was running through the planer is for the very next one!